The curry for people who don’t like curry. Normally bland, tasteless and swimming in cream, the average Asian restaurant korma is as far away from the real deal as it’s possible to get. I’d hesitate to say that the humble korma is the most abused of the curry house staples – that honour goes straight to the vindaloo – but the difference between a real korma and it’s Anglicised, watered down cousin is palpable. It’s not clear when and how the korma developed, but it probably came into being in the Moghal’s Islamic courts in around the sixteenth or seventeenth century. On the sub-continent, a korma is a rich, special occasion dish that uses a lot of expensive spices and other top quality ingredients. It’s a party or banquet dish, made once in a while to celebrate something special, a long way from the standardised English approximations. To start, take a deep breath, ignore the cost and put a teaspoon full of saffron threads into a mug and pour four generous tablespoons of warmed double cream over them. Stir the cream until it starts to turn a mellow yellow colour and set it to one side. This will be your final flourish. As with any good curry, the base of the dish is a heady concoction of spices, in this case twelve cardamom pods, four medium sticks of cinnamon and six bay leaves, which should go into a large, hot pan with a very decent glug of a neutral oil such as groundnut in it. The spices will hiss and you’ll be able to smell them immediately, a huge aroma bomb exploding in the pan. Next fry 2.3kg of chicken thigh meat in batches until it starts brown. The chicken should be skinned, off the bone and cut into big pieces. I think that it’s good to cut meat for curries on the large size, as so often in an Asian restaurant, it’s cut on the small side, and some of the essential earthiness and rusticity of the dish is lost. As you brown the chicken, try to keep as many of the spices in the pan as you can. No curry is complete without the Holy Trinity of onion, garlic and ginger, so in they go. First up, slice two onions into fine rings and gently cook them in the same pan until they start to brown, then add eight cloves of crushed garlic and two tablespoons of grated fresh ginger. Cook for a few minutes. This korma is about luxury, so there should be some more fine ingredients in it. Add four tablespoons each of peeled, whole almonds and sultanas. You need some more kick, a bit more depth of spice flavour, so add two tablespoons of ground coriander and a tablespoon of ground cumin. Coriander and cumin are powerful spices, and provide essential backbone to the finished dish. Things are starting to come together now, and the main flavours are in the pan already. Slide the browned chicken back into the pan, along with any accumulated juices, and stir in 250ml of plain yoghurt. The yoghurt forms the basis of the korma’s characteristic creaminess. There are a couple of things missing. Some salt is essential, about two and a half teaspoons, and there needs to be some heat. In Britain, a korma is a mild, bland dish, so adding anything up to two teaspoons of cayenne pepper might seem unusual, and if you taste your creation after its cooked for ten minutes on a medium heat, partially covered, it’ll taste unusual too – harsh, fiery and utterly out of control. It’s going to calm down. Remove the lid and turn the heat up so that the sauce reduces and starts to cling to the meat. Be careful not to let the sauce catch on the bottom of the pan. The sauce will have mellowed out a little now, but to help it on its way, stir in the saffron cream and up to 120ml of water, just enough to let the sauce down to a thick, creamy consistency. Stir in half a teaspoon of garam masala, cover the pan with its lid and reduce the heat to the lowest possible and cook for a final five minutes before serving with basmati rice. Do the cardamom pods go in whole? I don't do Indian very often and am always uncertain what to do with these – whole, crushed with husk or ground seeds only. Maybe you can set me straight?! They go in whole, straight into the oil. You can fish them out of the finished dish, on the plate if you want. Great post – I've made the chicken korma from Jaffrey's other book (From Curries to Kebabs), but I will have to check out this book. 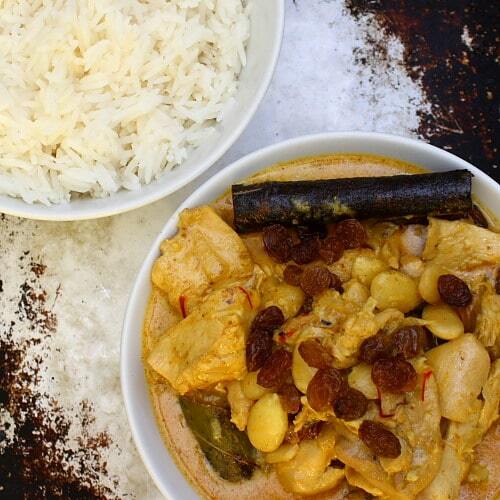 Love korma too – thanks for sharing. Made this – it's amazing! It's our fave out of the book, and neither of us usually for a Korma. This sounds amazing. You can't imagine how difficult it is to get good Indian food here. I love not only the sound of this, but the fact that is seems so doable. Thanks for posting it. I avoid Korma at all costs normally but this one sounds amazingly tasty. Oh my gosh, that looks fantastic. And your instructions are so precise and wonderful that I wanted the dish even more after reading them. I need to get my hands on more cardamom pods! I'm not a lover of the korma you get in restaurants or take aways, but this one is fab. We've made it a few times and recently when we had friends round for dinner it went down very well. Your picture is making me want to eat it now!! I'm in the same boat – never, ever order a korma, but this one is very, very different from a standard restaurant dish. I was most unimpressed. I love curries and have prepared hundreds of various types in my life as an amateur cook. But this one was weird. The saffron, I think was totally excessive and gave an unpleasant, medicinal taste to the dish. I have tried a number of ms. Jaffrey’s recipes over the years and have always been, always, disappointed. I do not understand why she is so celebrated. I really don’t. Is this verbatim from Madhur J? I always find the same in these recipes online: You forget to mention things. i.e. what the hell does ‘slide the browned chicken along’ mean? Then at the end it says, ‘remove the lid’………….what lid? no lid was mentioned! You tell us to add the onion to the chicken and spices and cook until starting to brown. Well by this time there is very little oil left….it’s mostly water from the chicken and onions……so it’s never going to brown is it? I knew this, so I did it in a separate pan. I know Madhur Jaffrey’s recipes very well….I have been following for more than 35 years. I have never had any problems until now. Which is why I say ”is this verbatim”? Yeah, chicken is a funny thing – a decent chicken isn’t pumped full of water to increase its weight, so consequently, there won’t be a lot of water in the pan when you cook it. It’s feasible, and preferable, to fry the other ingredients in the remaining oil and any fat from the chicken – doing this lifts all of the flavour from frying the chicken up into the curry. I do this every single time in exactly this way. On the lid front, it’s clearly stated that the pan should be partially covered in the sentence before. Good call on the “what the hell does…” thing – a stray ‘back into the pan’ clause, I’m afraid. My bad, but vey obvious what to do.
. . . how are the spices you added (cardamom, cinnamon bay leaves, coriander and cumin) different from the spices in the garam masala? The first batch are added to the base of the curry, so they flavour it in a long, slow, mellow way. The garam massalla is a final hit of fresh, zingy flavour. Same spices, but totally different.